Pushing the boundaries of creativity is what I enjoy most! My paintings are typically a composite of a photograph and my imagination where I creatively blend the two. Not being bound to specific shapes or colors but rather having the freedom to use my creative spirit is what I relish. Being intrigued by line and shape, it was instinctive to be drawn to figurative art where my female figures appear soft and gentle but have an obvious mysterious edge. My love for figurative art carries over to my abstract work where the sensual line and shape is evident again in hopes of stirring the curiosity of viewers, perhaps transporting them to a familiar, soothing place. At the start of a painting, my focus is on color harmony and composition. Therefore, a color palette is chosen with paints laid out in front of me, and then I move on to composition. Initially, I have an idea of what the composition will be, but in the end, the painting dictates to me! Having a passion for heavy texture, I begin by building layers using various acrylic mediums. Working on a flat surface, I utilize both brushes and palette knives manipulating oils, acrylics, inks, and charcoal. Using a loose style, I apply paint sometimes tilting, dripping and spraying which frees my imagination, and the composition comes to life in a soulful movement, giving me direction. I strive to create art that will enrich the quality of life for myself and others and that will inspire a desire to create by pushing the boundaries of creativity. 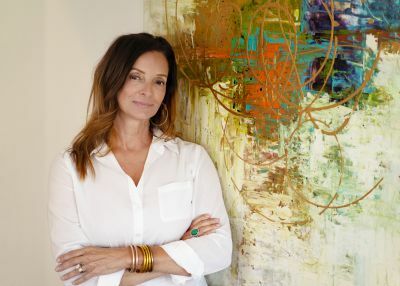 Having always loved the world of art, figurative abstract painter, Garnet LeMaire, contributes her own unique style and flare to the artistic milieu. She specializes in the female figure with spontaneous, abstract backgrounds. Her rich palette blends with vibrant color and contributes to the mysticism and soulfulness of her work. LeMaire enjoys researching processes and techniques and has attended many workshops over the years to gain perspective. She has gained knowledge in and experimented with oils, acrylics, charcoal, encaustics, and collage. “Initially, I studied the works of Henry Asencio in my early days of lessons,” she furthers, “and my favorite online and at-home DVD studies have been with Robert Burridge. “Each time I study under another artist, I gain insight on their individual creative approach and techniques, and sometimes I incorporate that into my own style. LeMaire has developed a loose style that is a composite of photographs and her imagination which allows her to creatively blend the two. “I am also inspired and motivated by other creative people, therefore, I enjoy spending time with other artists,” she claims. “It seems to trigger something in me.” This creative closeness allows LeMaire to experience an open artistic flow that has made way for her unique style and process. There is a clear passion for heavy texture in LeMaire’s work, and she loves pushing the boundaries. “Experimentation has been my ‘best friend’ with regards to developing my technique,” she states. She utilizes palette knives and brushes to manipulate oil, acrylics, and charcoal to achieve her goals with texture. These tools help aide in the soulful movement of her imaginative subject matter. LeMaire currently resides in Lafayette, where she is continually learning and creating in her at-home studio space. She continues to educate herself with the most current techniques. In addition, LeMaire and her husband Thomas are avid supporters of their community. They serve as Rain Angels for Festival International de Louisiane, contribute to several local charities, and are strong supporters of Our Lady of Wisdom Catholic Church. LeMaire has donated paintings to the American Cancer Society Gala and to Palates and Pate’ in support of shelters for women and children. As a former educator, she has enjoyed being a member of the Lafayette Education Foundation Board and was a volunteer for VITA where she worked with illiterate adults. Garnet and her family enjoy attending the many music and art festivals held in Lafayette and surrounding areas; Rhythms on the River, Downtown Alive, Festival International, and Festivals Acadiens to name a few! She also participates in the local downtown art walk which takes place monthly. The arts are thriving in Lafayette and she considers it a blessing to live in a community where appreciation for the arts is so evident. She is proud to have her work represented by local galleries, and also participates in art shows periodically in Lafayette and surrounding areas. Garnet earned a Bachelor of Arts degree in Elementary Education at the University of Louisiana at Lafayette. Her need for creativity in the classroom opened her mind to the world of art that ultimately changed the direction of her life. LeMaire continues her independent studies by researching processes and techniques and has attended many workshops over the years to gain perspective. LeMaire is a mixed-media artist and works primarily with acrylics, inks, and charcoal. Having a passion for heavy texture, she begins by building layers using various acrylic mediums. Her paintings are typically a composite of a photograph and her imagination where she creatively blends the two. Favorite subject matters include impressionistic female figures and non-representational abstracts. Most of Garnet’s paintings are done on gallery-wrapped canvases with painted edges. As another option, she also works with a custom framer who builds contemporary floater frames which complement her pieces well. Garnet and her husband, Thomas, are avid supporters of their community and are the parents of three daughters. The entire family enjoys attending the many music and art festivals held in Lafayette and surrounding areas. Garnet’s paintings may be acquired through fine art galleries in Lafayette, Louisiana.